AN ELECTRIC EXPRESS LOCOMOTIVE on the Austrian Federal lines. The engine, 1670 class, has independent axle drive, and the wheel arrangement is 2-8-2. The railway uses single-phase alternating current of 16 cycles, 15,000 volts at the contact line. There are at present 215 electric locomotives in operation on the Austrian Federal Railways. BECAUSE of its geographical position in the heart of Europe, Austria has always been of importance as a stage on the line of through traffic between northern and southern Europe, and as the gateway to the Near East. After the collapse and subsequent partition of the former Austro-Hungarian Empire, Austria was severed from its most prosperous industrial areas. The railway system of the country, deprived of many of its most remunerative sections, was left mainly with mountainous lines bearing comparatively little traffic, and costing much to maintain and operate. Nevertheless, several important expresses still pass through Austria. Among these are the “Orient Express”, from Calais and from Paris, and the “Ostend-Vienna-Orient Express”, from Ostend and from Amsterdam to Vienna. Budapest, Bucharest. Belgrade, Sofia, and Istanbul (Constantinople). There is also the “Arlberg-Orient Express”, which runs from Calais and from Paris to Vienna, Budapest, Bucharest, and Belgrade, where it joins the “Simplon-Orient Express” for Athens, The time from London to Vienna by the “Arlberg-Orient Express”, which enters Austria from Switzerland by the frontier station of Buchs, is twenty-eight and a half hours. The other expresses, which have traversed Germany, and take two hours less to reach Vienna, enter on the north; the “Orient Express” via Salzburg, and the “Ostend-Vienna-Orient Express” via Passau. The route of the “Arlberg-Qrient Express” is said to be the most picturesque in Europe. From the crossing of the Swiss frontier at Buchs, through Innsbruck, Salzburg, and Linz to Vienna, there is a succession of wonderful views of mountain, valley, and stream, of snow-covered peaks and glacier formations. The needle spires of the Tirolese churches, which seem to dominate the tiny villages in the valleys far below, gradually give place to an Oriental type of spire as Vienna is approached, showing even to-day the influence of the Turkish invasion of this part of Europe centuries ago. The beauty of Austria’s scenery and the fame of its healing waters attract visitors in large numbers, and the country’s greatest industry to-day is its tourist traffic. Nowhere, except perhaps in Switzerland, is there a land so adapted for holidays of a new and inviting character. A highland country in the true sense of the word, Austria possesses some of the most magnificent scenery in the Alps. It was the writer’s privilege recently to travel over the western lines in a special train to which was attached an open observation car. From this car it was easy to appreciate the immensity of the task which faced the railway engineers when constructing the line over the Arlberg Pass, tunnelling their way through high mountains, and bridging the swollen streams which flowed from the glaciers above. The tunnels are not the least of the engineering wonders of this railway, and they seem to follow in quick succession. Between Bludenz, in Vorarlberg, and Innsbruck (eighty-four and a half miles) there are sixteen tunnels, most of them in the earlier portion of the journey. The Arlberg Tunnel is the longest, with a length of over six miles. ALL AUSTRIA’S MAIN LINES are controlled by the Federal Railways, including those formerly in the possession of the Empress Elizabeth’s Railway and the Austrian Southern Railway. There are 3,321 miles of standard gauge and 315 miles of narrow gauge line in existence. It is a strange and exciting experience to ride in an observation car over such a route. The long climb to the summit over a maximum gradient of about 1 in 33, the glimpses of rushing torrents far below, and the frequent tunnels - which, save for the darkness and the drip from the roof, are not unpleasant in these days of electric working - combine to make the journey an eventful one. This line is much exposed to the forces of nature on its western section from Langen to Bludenz during the winter months. At these times the operation of the line is carried out under great difficulties, as avalanches, great and small, block the line after a sudden thaw. Even the most modern rotary snow-ploughs are of little use in such circumstances, for the avalanches bring down vast quantities of stones as well as trunks of trees, and these can be removed only by manual labour. When the line is completely blocked trains have to be diverted to the German Railways via Lindau, Munich, and Kufstein, or via Munich and Salzburg, as happened when the Prince of Wales visited Kitzbühel in February, 1934. Protection against avalanches necessitates the use of palisades, snow fences, snow rakes, snow bridges or sheds, and terrace walls, of which the last-named are the most important. Since the Arlberg line had to be closed in the winter of 1934-35 for a lengthy period because of avalanches, it is proposed to build a further tunnel and to lengthen the existing protective roofs and galleries at a cost of £200,000. By these means it is hoped to keep this important route open in the worst weather. The Arlberg Pass is connected with Reutte and other places in the Ausserfern district by the marvellously-constructed highway known as the Flexenstrasse, which goes over the Flexen Pass at a height of 5,887 ft. This is partly hewn out of the rock, and passes through tunnels and avalanche shelters in the manner of a railway line, descending in numerous hair-pin bends to Steeg. The top of the Arlberg Pass is the watershed of the Danube, and of one of the tributaries of the Rhine. On one side the water finds its way to the Black Sea, and on the other to the North Sea. Continuing along the Arlberg route and through the Upper Inn Valley, the line comes successively to Landeck and Imst, and then to Innsbruck, the capital of Tirol, and an important junction where the Paris-Vienna and Berlin-Rome expresses cross. The attractions of Innsbruck and of its immediate surroundings are many. There are few who will not wish to stay a day or two in this charming town, where Tirolese costumes and ancient buildings are among the quaint sights encountered. Beyond Innsbruck, on the route to Vienna, are Kitzbühel, famous for winter sports and for summer bathing in the Schwarzsee, where warm springs keep the water at a comfortable temperature; and Zell-am-See, which is a sort of unsophisticated Interlaken. Zell-am-See is surrounded by mountains, and is an ideal centre for excursions to the lakes, valleys, and waterfalls of the neighbourhood. Here, also, begins the Grossglockner Alpine road, the great new motor highway, thirty miles in length, which crosses the Alps, and creates a new line of communication from north to south. It was planned for completion in August, 1935. IN THE SEMMERING VALLEY, AUSTRIA. 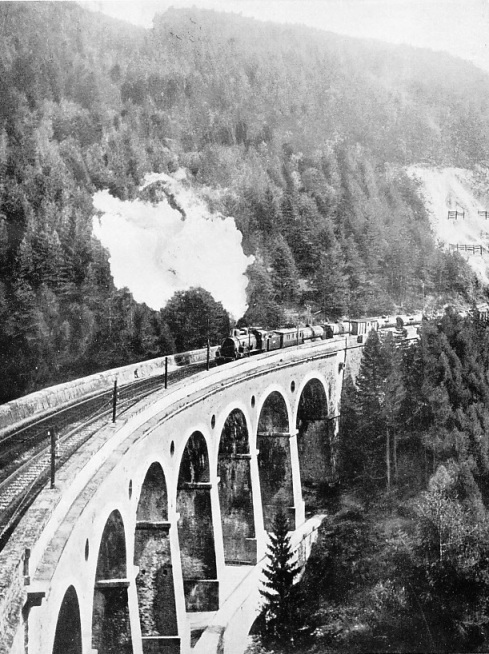 A goods train crossing the curved Gamperi Viaduct. It is near Semmering that the line begins to ascend the famous Semmering Pass. Between Murzzuschlag and Gloggnitz - 47 miles from Vienna - the line rises over 700 ft. In eleven miles. The railway, which was one of the first Continental mountain lines, was built in 1848-1854. Throughout this wonderful journey a veritable panorama of mountain and valley scenery passes before the eyes. Through the mountain passes and valleys, river, rail and road run side by side. At other times the river or the road can be seen far below, while the railway clings to the din face or tunnels its way through a mountain. Schwarzach-St. Veit is the junction for Badgastein and the Tauern Railway. Farther on, by the side of the rushing Salzach, fresh from the glaciers of the Hohen Tauern, is Salzburg, the international tourist centre, the city of the world-famous musical festivals and plays, and the birthplace of Mozart. Salzburg, gateway to a magnificent realm of mountain and glacier and dominated by the fortress of Hohen-Salzburg, is a city where the Middle Ages are very close to the most modern comfort and culture. On the recommendation of the late Sir William Acworth, a complete reorganization of the former Austrian State Railways took place in 1923. Since October 1 of that year the State-owned lines and the privately-owned railways have been conducted as a private enterprise under the title of the Austrian Federal Railways. This procedure was adopted to free the undertaking from possible political interference, and from the hampering influence of the national budget, and to enable steps to be taken to adapt the system to the increasing demands which were being made upon it. Although the railways are now organized as an ordinary commercial undertaking, they are not entitled to retain their revenues, and they are bound, at the same time, to adapt their services to the public needs and the public interest. There is an interesting piece of history attaching to the Austrian railways; the first railway built in Austria is claimed to have been also the first railway on the continent of Europe. For centuries there was an active overland traffic in salt from the mines of the Salzkammergut, near Salzburg, to Bohemia between the Danube and the Moldau. At the beginning of the nineteenth century increasing trade called for improved transport, and this led to the construction of Austria’s first railway. On March 31, 1808, a memorable day in Austria’s railway history, Dr. von Gerstner, Professor of Mathematics in the University of Prague, proposed the construction of a railway line, a transport medium of which he had heard from England. Gerstner advocated a horse railway from Linz to Joachimsmuhle, but left the project in the hands of his son, who in September, 1824, was granted by the Emperor Franz I the exclusive right of building a wood and iron road between Mauthausen, on the Danube, and Budweis (now called Ceske-Budejovice). situated on the Moldau. The first section was opened on September 7, 1827, and the centenary of the event was celebrated in 1927. A large gathering of railway representatives from all over the Continent then met at Unter-Dvoriste, the frontier station between Czechoslovakia and Austria. Very little of the original road was then in existence, except the remains of some of the bridges, which were inspected by the centenary party. At first, both horse and bullock traction were employed, but Gerstner was anxious to introduce locomotives, which he had probably seen working on colliery lines in the Tyneside area when he visited England in 1820. The railway, before being completed, was diverted from Mauthausen to Linz, and was opened throughout on August 1, 1832. It was built to a gauge of 3 ft 7½-in, and had a ruling gradient of 1 in 120. The last horse-drawn train ran on December 12, 1872, between Linz and Kerschbaum, but the extension of the line from Linz to Gmunden was converted to locomotive traction in 1854. AN AUSTRIAN POWER STATION west of the Tauern line. The power stations for the electrified routes are connected by transmission lines arranged for 55 kv. The system is so organized that it permits parallel working of the stations. In sub-stations the 55 kv current is stepped down to 15 kv. The higher-voltage equipment is installed in the open. This was the first narrow-gauge steam-operated railway in any of the Germanic States. In 1857 the undertaking passed to the Kaiserin Elizabeth Railway Company, which operated the Vienna-Salzburg line, and in 1869 that company rebuilt the railway to standard gauge, converted it to locomotive working and made several improvements. One of the results of the disintegration of the old Austro-Hungarian empire was the loss by Austria of her chief sources of coal, only about one-half of the coal-fields of the former empire remaining within her borders. It therefore became necessary to import some sixty-five per cent of the annual coal requirements (about 9,000,000 tons), and this reacted unsatisfactorily upon an already unfavourable trade balance. To relieve the position to some extent, one of the earliest post-war developments was the building of a number of hydro-electric power stations, because Austria is particularly well furnished with water power. The extended use of electricity will cause this power to be exploited in the near future to the full. Before the war of 1914-18 no existing steam-worked railway had been electrified, although there were a few lines which had been worked from the beginning by electric traction. Among these the Mittenwald Railway, forty miles in length, was the only standard gauge electric line of main-line character. 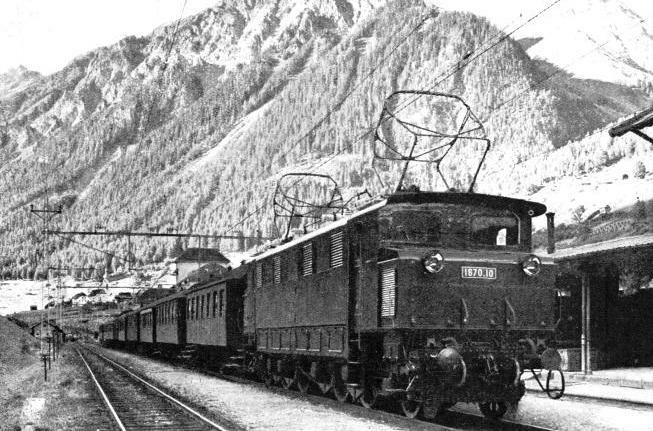 This line, which connects Innsbruck with the Bavarian frontier, was opened in May, 1913. It was worked with single-phase alternating current of 16⅔ cycles and a voltage of 15,000. 1. Innsbruck-Landeck-Bludenz-Feldkirch-Buchs, with the branch line from Feldkirch to Bregenz. 2. Salzburg-Innsbruck, with the branch lines from Worgl to Kufstein (German frontier) and from Innsbruck to Brenner (Italian frontier). 3. Stainach-Irdning - Attnang-Puchheim (Salzkammergut line). 4. Schwarzach-St. Veit - Spittal-Millstättersee (Tauern line). 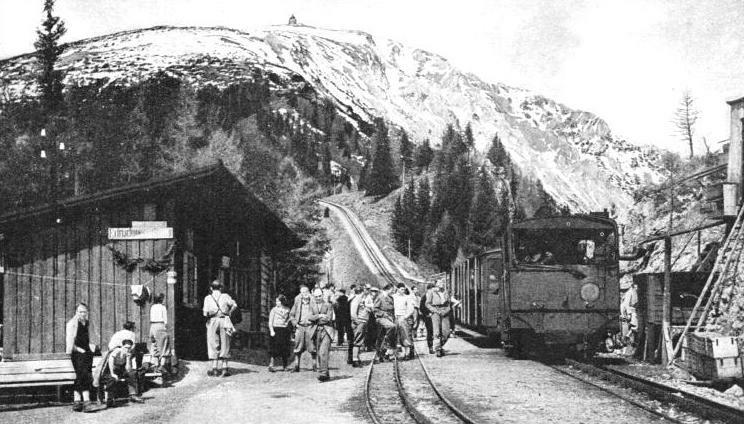 A beginning with the work of electrification was made with the railways of Tirol which, by reason of the steep gradients and long tunnels in the Arlberg section, were particularly suitable for electric working. All these lines were electrified between 1923 and 1926. The electrification was followed by increased train speeds on the important Arlberg route from Western Europe. 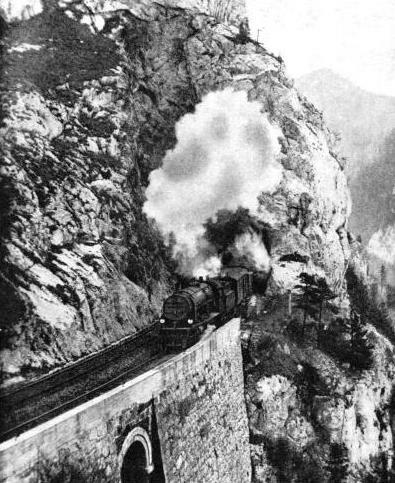 In consequence, the doubling of the track over this section, and the artificial ventilation of the Arlberg Tunnel, which had become necessary owing to excessive soot and smoke from steam working, were rendered unnecessary. There are now 571 route miles of railway electrified, mostly main lines, in addition to certain short lengths originally constructed as electric railways before the war. Of these the metre-gauge Modling-Hinterbruhl line has been in existence since 1883 - the year of the opening of the Brighton Electric Railway, described in the chapter beginning on page 605. ELECTRICALLY HAULED. A heavy freight train on the mountainous Mittenwald line. Extensive electrification has been the post-war policy of the Austrian Federal Railways, and to-day some 571 miles of route are electrified. In one year the railways in Austria carried over 19,200,000 tons of goods. As the German State Railways and the Swiss Federal Railways had adopted on their electrified lines single-phase alternating current of 16⅔ cycles, 15,000 volts at the contact line, the Austrian Federal Railways decided to use the same system. This enables Austrian electric locomotives to work into the common frontier stations of German and Swiss railways. It was only at the Italian frontier station, Brennero, that difficulties were encountered, by reason of the difference in the current systems, which was unfortunate in so far as it affected facilities for international traffic. To overcome this difficulty, the Austrian Railways constructed, about a mile from Brennero, a new station, Brennersee (or Brenner), up to which point trains are worked electrically, while from that station to Brennero steam haulage is used. Four new power stations were built to supply the necessary energy for the electrified sections. These were at Spüllersee, near Bludenz; Ruetz, south of Innsbruck; Stubach, south of Kitzbühel; and Mallnitz, west of the Tauern line. Arrangements were also made with the privately-owned Achensee power station, between Innsbruck and Kitzbühel, to supply current for the lines west of Salzburg, and with the Steeg power station for a supply to the Attnang-Puchheim section. The power stations are connected by transmission lines arranged for 55 kv, and the system is so laid out as to enable parallel working of all stations, as well as division into individual groups, to be possible. In the sub-stations the 55 kv current is stepped down to 15 kv. Four of the older sub-stations on the Arlberg line are in covered buildings, but others are constructed as semi-open-air stations, the 55 kv equipment being situated in the open, with the 15 kv installation, as well as the control-room, under cover. Three transformers are installed in the sub-stations, these being arranged to supply the necessary lower voltages for continuous output. Adequate testing equipment is installed in the sub-stations for the speedy remedying of service interruptions on the trolley wire. The mean range of a distributing station is twenty-nine miles, and it is possible, if one station is shut down or out Of action, to feed the section from the neighbouring stations without any serious fall of voltage. 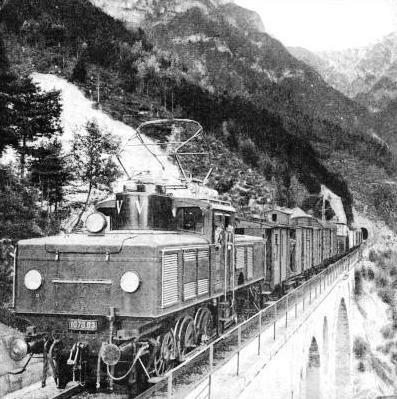 Among the many notable examples of Austrian railway engineering skill must be numbered those which were carried out before the Great War in constructing the second railway connexion with Trieste - the Tauern Railway. The chief obstacle in building the line was the surmounting of the massive mountain range, the High Tauern, which was overcome by the driving of a tunnel 5 miles 551 yards in length before the construction of the line was undertaken. Altogether it was necessary to construct seventeen tunnels with an aggregate length of 9 miles 196 yards, two of which, the Tauern and Dossen tunnels, were equipped with the Saccardo system of ventilation. There are also on the Tauern Railway no fewer than 260 culverts, while viaducts number thirty-four. The iron bridges on this particular line have a total length of 952 yards. The total length of the Tauern Railway is fifty miles. On the north side of the Tauern range it rises 2,083 ft, and On the south side 2,251 ft. The highest point of the line is reached in the Tauern Tunnel (4,022 ft), and the steepest gradient is 1 in 37. The railway is a single line, except the section between Böckstein and Mallnitz, which includes the Tauern Tunnel. A journey over the Tauern Railway discloses scenes of great beauty. In climbing the High Tauern the whole of the Gasteiner Valley, with its famous health resorts, is seen below. Badgastein, 3,550 ft above sea-level, with its great waterfall tumbling through the centre of the town, and its cluster of hotels on the sides of the hills, is the gem of the district. It contains some of the most highly radio-active springs in the world, which gush from the ground at a temperature of 117° F. and provide an ample supply of hot-water mineral baths to the whole town. Proceeding, the passenger sees, far below, villages and farms dotted here and there along the turbulent River Ache, but they are so distant as to seem almost Lilliputian. Winter sports on the high ground of this district attract many thousands of visitors each year. HOLIDAY-MAKERS in Austria at Baumgartner Station on the rack railway up the side of the Hochschneeberg. This station is 5,570 ft above sea-level. Austria possesses many mountain railways, some of which are electric and are worked in conjunction with the Federal Railways. Work was begun on the Schwarzach-St. Veit-Mallnitz section, on the northern slope of the Tauern range, in June, 1933. Six months later this section - twenty-eight and three-quarter miles long - was opened to traffic. On the southern incline of the Tauern between Mallnitz and Spittal-Millstättersee electrification was completed at the end of April, 1935, through services being introduced the following month when the summer time-table came into force. The electrical energy consumed on this line, some 11,000,000 kw hours, is obtained from the Federal Railways power stations at 55,000 volts. As the equipment of these stations was capable of producing supplies of current considerably in excess of that previously required, the increased demand following the electrification of the Tauern Railway was met practically without cost. Mainly for this reason the cost of electrifying this line did not exceed £400,000. Similarly, power for the northern section of the line is supplied by the main lines sub-station at Schwarzach-St. Veit, only the provision of additional switch-gear having been necessary. The saving in journey time resulting from the electrification of the Tauern Railway section amounts, as with the Arlberg line, to about twenty-five per cent on passenger trains and fifty per cent on goods trains. Important savings have also been effected on coal, consumption having been very high in the working of steam locomotives because of the frequency and steepness of the gradients which have to be negotiated. The number of locomotives in service on the Austrian Federal Railways is 2,338, of which 2,041 are steam locomotives and 215 electric, while there are twenty-seven electric rail-cars and fifty-five internal combustion cars. Road competition and the heavy decrease in traffic led the railways to construct small high-speed steam-driven vehicles, and a number of superheated steam rail-cars burning coal or crude oil were ordered. Experiments are also being made with Diesel engines, and various types were put into service in 1934 on secondary lines, as well as for feeding services to important railway centres. An eight-wheeled Diesel-electric car is equipped with a 160 hp Diesel engine, and can haul two ten-ton trailers. An Austro-Daimler type of eight-wheeled petrol-hydraulic rail-car, for high-speed long-distance traffic, has also been put into service. The exterior of this type of vehicle, which is streamlined, looks very attractive, and it has become popular with the public. Although in Austria the main field of usefulness for rail-cars is in local and secondary lines, they also render valuable service in connexion with express traffic on main lines. The passenger carriages of the Austrian Federal Railways number 7,854, and freight wagons, 33,660. The trains usually carry three classes. Third-class compartments, holding eight or ten passengers, have wooden seats, first- and second-class compartments have upholstered seats. Four or six passengers are accommodated in first-class and six or eight in second-class carriages. The fast trains and “D” trains carry all three classes, local trains second- and third-class only, but through luxury trains, such as the “Arlberg-Orient express”, have first-and second-class only. A large number of carriages and wagons have been scrapped in recent years, and replaced by modern stock of steel construction. Altogether, a sum of £3,000,000 has been expended on new rolling-stock, £950,000 on passenger coaches, £200,000 on service vehicles, and £1,880,000 on freight wagons. By the introduction of new types of freight wagons the Austrian railway authorities have been able, although at very considerable cost, to effect an all-round speeding up of both internal and international goods traffic. With the introduction of electric traction, considerable difficulties presented themselves. The permanent way, due to the effects of the war, was in a bad condition. This and the severe gradients on many of the electric lines accounted for the multiplicity of types of electric locomotives originally introduced, but these have since been standardized and reduced in number. THROUGH THE MOUNTAINS. A train on the spectacular Semmering Pass route from Vienna to the south. Because of the heavy gradients the express is hauled by a 2-10-0 locomotive. This photograph shows the train emerging from one of the many tunnels through the projecting mountain spurs which are a feature of this section. For the miles of electric lines west of Salzburg three locomotive running sheds were built from 1923 to 1929, namely: Innsbruck, Bludenz and Salzburg. Innsbruck running shed provides the electric locomotives for nearly all trains-de-luxe and international expresses between Salzburg and the Swiss frontier, as it is found that long locomotive runs can be accomplished most economically by a running shed situated in the centre of the district. Innsbruck also provides power, with the sub-shed at Worgi, for Tirol local traffic, and for express, slow passenger and goods trains on the Mittenwald line, the line to Scharnitz and the through line from the German frontier at Kufstein to the Italian frontier at Brenner. The long and difficult mountain sections in Tirol impose serious restrictions in speed. 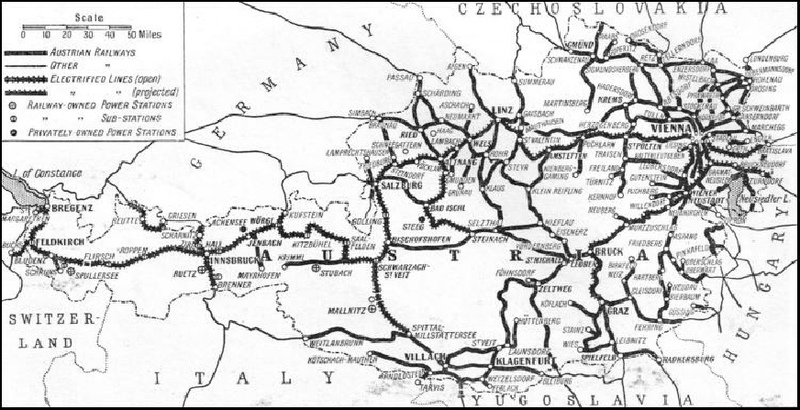 In spite of these disabilities it is possible for an electric train to cover the fifteen and a half miles section from Bludenz to Langen, with a mean gradient of 1 in 33, in thirty-six minutes; a journey which would have occupied nearly double that time by steam-hauled trains. On these gradients also, in addition to double heading, banking engines have normally to be employed. This precaution is obligatory, under regulations internationally agreed upon for traction units of light construction. To increase the reliability of the train services numerous improvements in signalling and safety appliances have been introduced, such as colour-light signals, warning signals at level crossings, and so on. Improved telephone and telegraph facilities were installed in connexion with the introduction of electric traction. There are also numerous mountain railways, some of which are electric and worked in connexion with the State railways, while others are funicular and cogwheel or suspension railways. One of the most interesting of these mountain railways is the Semmeringbahn, one of the oldest mountain railways in Europe. On this line there is a succession of tunnels as the railway climbs to the summit of 3,000 ft over viaducts, and numerous galleries until the final tunnel, 1,530 yards long, is reached. There are in all about eighteen mountain railways of narrow or normal gauge, rising to various heights through tunnels and galleries and providing superb scenery. There are also about a dozen cogwheel and suspension railways in various parts of the country, by which the tops of lofty mountains are reached in a few minutes without the slightest difficulty. The summit stations are usually provided with modern hotels and restaurants, and from them excellent ski-ing districts can be reached. Two of these suspension railways are easily reached from Innsbruck. The Patscherkofel is the massive northwestern pillar of the lower Alps of Tux. From the mountain hotel at the top of the railway (7,570 ft), which is reached in about twenty minutes from Igis, near Innsbruck, there is a magnificent panorama comprising 400 mountain peaks. On the opposite side of Innsbruck, and seemingly just at the end of the Mariatheresienstrasse, is the Hafelekar, the top of which (7,660 ft) is reached by a combination of funicular and suspension railway in an hour. This summit commands a fine view of the Karwendel Mountains, the Inn Valley, the Zillertaler Alps, and the Stubaitaler Alps. There is, in addition, the Vienna City Railway, or Stadtbahn, which is a sort of Inner Circle and was formerly worked by the Austrian Federal Railways by steam. After the War, however, it was found impossible to carry it on as a railway. It was therefore electrified and converted into a tramway as part of the municipal tramway system. The Stadtbahn did not connect the seven main line stations of Vienna. This is done by the Suburban-Line and the Junction Railway, which link the termini together much in the same way as the “Ceinture” does in Paris, although there is no circular service as in that city. A MODERN AUSTRIAN LOCOMOTIVE with an unusual wheel arrangement known as the reversed “Mountain” or 2-8-4 type. The bogie is specially placed at the rear of the engine to support an extra large firebox. You can read more on “Electrification in Europe”, “Germany and Holland” and “Speed Trains of Europe” in Railway Wonders of the World.